From the creator of Grey's Anatomy and Private Practice comes a captivating saga of illicit relationships, unchecked power and shocking political intrigue. Go behind the closed doors of Washington D.C.'s elite and watch as the plot unfolds in Scandal: The Complete First Season. When trouble rears its ugly head - headline-making, life-ruining trouble - there's only one person to call: the legendary Olivia Pope (Kerry Washington). 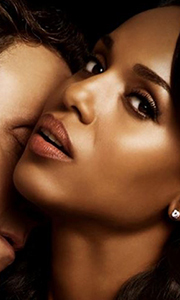 With h..
Own Scandal Season 2 DVD from Deff, DVD, Blu-Ray & 4K Video Specialists - Free UK Delivery..
Own Scandal Season 3 DVD from Deff, DVD, Blu-Ray & 4K Video Specialists - Free UK Delivery..
Own Scandal Season 4 DVD from Deff, DVD, Blu-Ray & 4K Video Specialists - Free UK Delivery..
Own Scandal Season 5 DVD from Deff, DVD, Blu-Ray & 4K Video Specialists - Free UK Delivery.. The hottest show on television takes ruthless ambition to staggering heights of shock and awe in ABC Studios' Scandal: Seasons 1-5. The Oval Office is up for grabs, and none of the players are playing nice, including Olivia Pope (Kerry Washington). Experience every jaw-dropping twist of her journey, as the "ultimate fixer" goes from repairing damaged reputations - to utterly breaking people who cross her, body and soul. Can she still la..